seaworthy old house with pool, seafront, barbecue, wood oven. Two-storey house with four rooms with sea views, two bathrooms, kitchen. seaworthy old house with four bedrooms, two of which overlook the sea and a balcony overlooking the sea and pool and two overlooking the village, two floors, upstairs four bedrooms and a bathroom, hallway and a small hall, plant floor with bathroom, kitchen, large lounge and outdoor pool and chill out, two terraces with barbecue, wood oven and parking in front of the house. Located opposite the ocean without any obstacles, only sea and amazing sunsets and surfers is directly in front of the wave of Quemao, one of our most internationally known waves. Nous avons passé une semaine très agréable dans cette maison face à la mer. Ivan a été très présent lorsque nous avons eu besoin de renseignements, adresse de médecin, commerces à proximité, location de matériel. Nous relouerons avec plaisir cette maison. Merci Ivan! Maison très agréable oû il fait "bon vivre". Le propriétaire est très agréable. Cette maison possède un coin barbecue et une piscine très agréables. La vue sur l'océan est spectaculaire. L'accueil par Fran est très chaleureux. N'hésitez pas à lui demander les bonnes adresses, il est de bons conseils en restaurants ou activités sportives. Le village de "La Santa" est plein de charme, authentique et on y trouve tous les commerces nécessaires. Une adresse que l'on recommande. 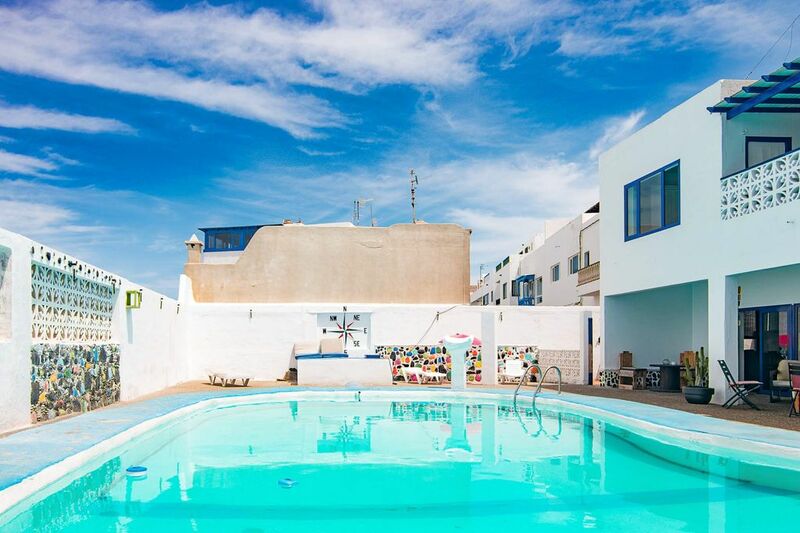 Muchas gracias por vuestro comentario y por elegir Lasantahouse para pasar vuestra estancia en Lanzarote. Nous avons passé une semaine à 5 amis dans la location de Fran et Ivan. La maison est grande, bien équipée et aménagée, et avec une vue imprenable sur la vague de Quemao : quel plaisir de suivre les surfeurs glisser en profitant du balcon ou de la terrasse. Les propriétaires sont très discrets et parfaitement ponctuels. Bref une maison a recommander! Merci à Fran et Ivan de votre accueil bien sympathique. La maison est très agréable, propre et calme dans l'ensemble. Nous avions une superbe vue depuis notre lit, toutes les commodités à pieds (super restaurant Verde Mar), départ de superbes balades à pieds vers la mer où les volcans. Facile pour se préparer à manger, les autres locataires son respectueux et relativement discret. On reviendra quand il fera un peu plus chaud pour la piscine, mais. Oui avons bien profité de la terrasse tout de même! Muchas gracias por vuestra visita y vuestro comentario. Fran è un ottimo host, gentile e premuroso, la casa è stupenda dotata di tutti i comfort, pulizia impeccabile,consiglio per chi vuol trovare relax ,fare passeggiate buona compagnia e surf!! Gracias para todos Fran!! Por tu visita y por haber cuidado de la casa como si fuera la tuya, esperamos volver a verte por aquí. It is a fishing village, located northeast of Lanzarote, with its small dock where every morning arrive fishermen with their fish, which preserve their traditions and quiet lifestyle is maintained, but where there are all kinds of services, restaurants, pubs, tapas bars, supermarket, shops, schools surf..etc. The Santa is known as the North Lanzaroteño Short, with waves of level internationally known and where surfers from around the world visit us to enjoy them, it is also the ideal environment to bike trails both road and mountain volcanic trails and all kinds of outdoor sports, trekking, swimming, diving, hang gliding, horseback against océano..etc, in fact in May one of the toughest triathlon in the world, the Aironman Lanzarote is celebrated. One of the activities more travelers are valued for tourist visits to places like the National Park Timanfaya Jameos del Agua, Mirador del Rio, Isla Graciosa, Cesar Manrique Foundation. etc. Of course emphasize that Lanzarote is a volcanic island with an enviable weather throughout the year, a biosphere reserve.